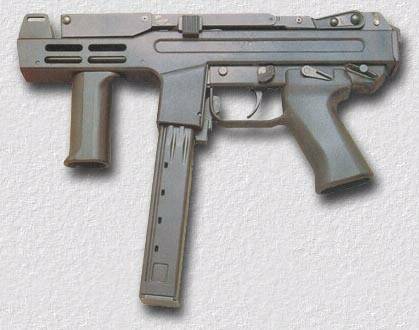 In 1984 the Italian firm of Sites introduced the Spectre submachine-gun. At the time the international weapons press was very positive about the new weapon, but it has failed to get large orders. This is really a shame, for although the Spectre looks a bit "cheaper" than, say, a H&K MP5, it is just as good a weapon. The Spectre certainly has some things going for it: It fires from a closed bolt for better accuracy, is relatively small, has a innovative magazine design, a standard folding stock, a standard vertical forward grip, and unlike most submachine-guns, it has a double action trigger and a decocking lever, meaning that the weapon can be carried totally safe, and is fired much like a lot of pistols, with a first heavy trigger pull, and subsequent lighter trigger pulls. The barrel has polygonal rifling, which increases its life, and is better for accuracy. The magazine has four rows of bullets next to each other, allowing it to be much less long for a given number of bullets. 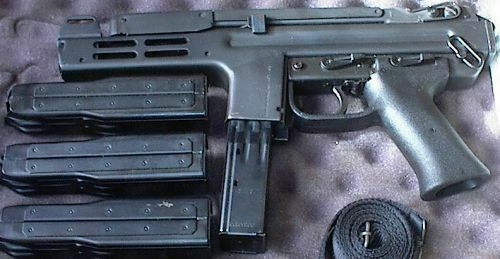 The fifty round magazine for the Spectre is about as long as a thirty round magazine for a MP-5. A thirty round magazine is also available. Weight: 6.4 lbs (2.9 kg) (empty) > Caliber: 9 mm Barrel: 5.1 inch (13 cm) > Length: 23.2 inch (58 cm), 14 inch (35 cm) with folded stock Action: Unlocked blowback, fires from closed bolt. Mode of Fire: Safe / Semi-Automatic / Full-Automatic Rate of Fire: 850 rpm > Range: 250 ft (76.2 m) Magazine: 30 / 50 round Cost: ? Made in: Italy Special: Innovative design, high capacity. Reliable. A good, but underrated design.